The County of Los Angeles Department of Public Works Headquarters campus located in Alhambra, CA is on a 17.5-acre site and is home to a 12-story office tower and accompanying 3-story annex. These two buildings provide approximately a half million square feet of building space for the 1,500 employees and 200 average daily visitors. In July 2014, we stopped watering the lawn areas on the campus. 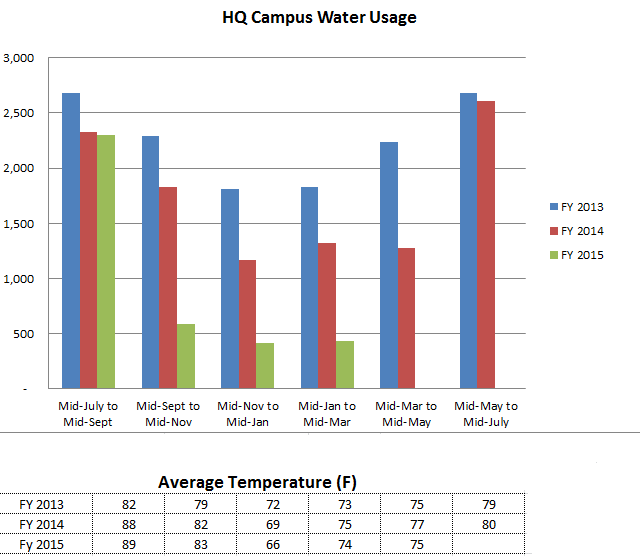 The graph below shows total water usage (irrigation, air conditioning, restroom, cafeteria, plumbing, etc.) since July 2013. Based on the water utility statements from the City of Alhambra, the water usage for the Headquarters campus is approximately 57 percent lower than the same period in Fiscal Year 2013-2014.